The world’s major cruise ship companies are in supersize mode. Six years after the launch of the largest passenger ship ever built, cruise giant Carnival Corp. announced that some of its upcoming vessels will hold more passengers than any other at sea: a maximum of 6,600. While they will be the most packed, those vessels won’t even be the world’s largest. That superlative belongs to Royal Caribbean International, which in 2016 will launch its biggest megaship yet, Harmony of the Seas. That 5,479-passenger, 227,000-gross-ton behemoth is a slightly bigger sister of the $1.4 billion Oasis and Allure of the Seas, which currently hold the “world’s largest” title. With upcoming new builds, Norwegian Cruise Line, MSC Cruises and Carnival Cruise Line are also preparing to launch their own biggest-ever vessels; each will hold about 4,000 or more guests. Although significantly smaller in size, new ships coming from Holland America Line, Seabourn, Regent Seven Seas Cruises and Silversea Cruises will also set new size records for each line. And new megaships can often command higher fares than older, smaller vessels that sail similar itineraries. A seven-night cruise on Oasis of the Seas, for example, starts at $946 per person during the week of Aug. 22, while the 3,634-passenger Independence of the Seas, which launched a year before Oasis, has weeklong sailings leaving Aug. 16 that start at $599 per person. Both ships depart Port Everglades and sail the Eastern Caribbean. No cruise lines are announcing plans to surpass the current record-holder, but few mass-market lines are ruling out such a move in the future, either. “It’s almost science fiction: How big can big get?” said Christopher Muller, professor of the practice of hospitality at Boston University. While some observers and safety experts worry about the implications of packing a small city’s worth of people into a floating resort, industry insiders say there’s little to stop cruise lines from growing their fleet with even larger ships. Vincenzo Petrone, chairman of ship builder Fincantieri, told Seatrade Cruise News that the Italian company is being approached about building ships between 250,000 and 260,000 gross tons. A spokesperson for the company would not comment when reached by the Miami Herald, citing confidentiality reasons. Tony Peisley, a UK-based cruise industry analyst, said in an email that he would “never say never” to the possibility of a company going larger than the Oasis class, especially considering how profitable those ships have been. He pointed out that a decade has passed since planning first started for the Oasis vessels and no one yet has broken the record. Representatives for MSC and Carnival both said port capabilities were crucial factors when designing their upcoming ships. Rick Sasso, president of MSC Cruises USA, said flexibility was key when planning the 4,500-passenger, 167,600-gross-ton Meraviglia. Cruise line executives insist that they have not been focused on setting records — only on winning popularity contests. The goal, Frizzell said, was to “exceed our guests’ expectations” while developing a vessel that could deliver on CEO Arnold Donald’s “long-term plan to return double-digit return on invested capital.” Translation: Build a ship that will wow guests and make a lot of money for the company. Frizzell said the ships, which are being built for the German AIDA brand and possibly Italy’s Costa Cruises, will feature more cabin and balcony space and a higher percentage of exterior staterooms. Public areas will be designed for multiple uses and will not include “space-consuming features such as water parks, skating rinks and bumper cars,” he said. Royal Caribbean Cruises, which owns the first- and second-largest sets of ships currently at sea — the Oasis and Quantum classes under the Royal Caribbean International brand — likewise says size was an afterthought. With room for 4,180 passengers at double occupancy, the Quantum ships launched so far cost about $1 billion each to build. In the case of Oasis of the Seas, which launched in 2009 as the first of what is planned to be four ships by 2018, the right ship design featured seven distinct neighborhoods including a Central Park; zip lines; nearly 30 restaurants and bars; balcony cabins overlooking the ocean and the park and 1,380-seat theaters for Broadway shows. 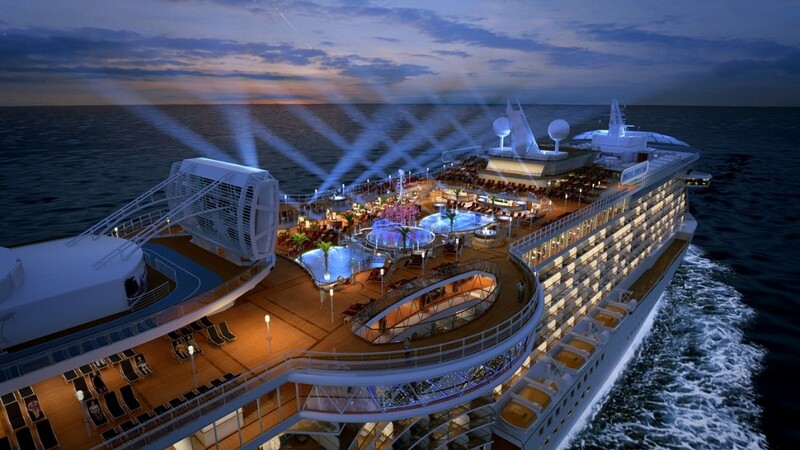 Nevertheless, Royal Caribbean has a track record of raising the size bar. Previous ships including Voyager of the Seas and Freedom of the Seas were, for a time, the world’s largest. Andy Stuart, president and chief operating officer of Norwegian Cruise Line, which will launch the 4,268-passenger Norwegian Escape in October and three sister ships through 2019, said the newest and biggest ships let the company take the most popular elements of its previous class and expand them. So the Escape and three sister ships will have a larger ropes course, a Margaritaville at sea and massive spa thermal suite. “We will build ships that continue to take the experience of freedom and flexibility to the next level and will certainly consider ships of any scale that meet that requirement,” Stuart said in an email. In addition to giving passengers more to do on big ships — and more reasons to get on board in the first place — cruise executives say operators benefit from economies of scale, personnel efficiencies and greater opportunities for onboard revenue. Andrew Coggins, a clinical professor of management at Pace University’s Lubin School of Business, said cruise companies save on the most highly paid shipboard personnel such as captain, hotel manager and chief engineer with large ships. The technical crew required to run a ship of the size Carnival Corp. recently ordered are roughly the same number as on a current smaller ship, said William Burke, chief maritime officer at Carnival Corp. But Sasso, whose company will operate the fourth-largest class of ships in terms of gross registered tons by 2019, believes there’s a point at which size benefits a cruise company more than a customer. Going bigger than current sizes, he believes, would serve economies of scale more than the onboard experience. Cruisegoers tend to be fascinated with megaships, even if some find the size prohibitive. On CruiseCritic.com, a popular news, review and community website focusing on cruise ships, Oasis and Allure of the Seas are among the most popular vessels featured on the site. “They get rated very, very well by our members,” said managing editor Colleen McDaniel. After news broke about Carnival Corp.’s newest order, McDaniel said most discussions on the site’s forums revolved around what it might be like to sail with 6,599 other passengers. Bonnie Arnold, a 62-year-old Parkland resident, is a big fan of small ships. But when her husband booked a family trip on Allure of the Seas “knowing full well I would absolutely hate it,” she found herself surprised. “I just loved it,” said Arnold, spokeswoman for Tri-Rail. She found privacy in the adult-only solarium and quiet in the observation deck bar. Even though she still prefers small ships, she has now cruised on Oasis-class ships several times. “Even though there are 5,500 passengers on a ship, it really doesn’t feel that busy,” Arnold said. But some other passengers who are overwhelmed by the largest vessels worry about the long walks to get from point to point; waits for restaurants or activities, and managing illness or emergencies with as many as 8,700 passengers and crew on board. Coggins and cruise lines said software that simulates an emergency and evacuation is used in the design process to ensure that crowds could move off the ship safely. International regulations require that lifeboats should be launched with everyone on board within 30 minutes from the time an abandon ship order is made. Captain Bill Doherty, a former safety manager for Norwegian Cruise Line who is now director of maritime relations with Nexus Consulting Group, said he believes cruise lines should better prepare for disaster scenarios in a variety of locations. Exercises like the Black Swan operation off Grand Bahama in 2013 — a collaboration between the U.S. Coast Guard, cruise industry, Bahamian officials and response teams — alone aren’t sufficient, Doherty said. He argued in a paper that cruise lines should be mandated to establish worst-case scenarios for any type of disaster based on the maximum number of passengers at any point along an itinerary’s route and plan for a timely response. Cruise line representatives say that while all vessels will carry the required number of life boats and life jackets, large new ships are safe by design due to built-in redundancies and other factors. Officials also say they don’t expect larger-sized ships with more people to be at greater risk of illness outbreaks. Medical teams will grow as the passenger count does, Burke said. “Quite frankly, this is always a frustrating question for us because the reality is that you and I ashore are much more likely to get sick than those people that are afloat on our cruise ships,” he said. Even as fleets grow with new jumbo additions, some cruise lines are swimming against the extra-large tide. River cruises have grown in popularity, with lines adding nine new ships last year alone, according to the Cruise Lines International Association. None of those ships had capacity for more than 190 passengers. Tall-ship line Star Clippers just announced an order for a new 300-passenger vessel, and Windstar Cruises expanded its fleet with three 212-passenger ships acquired from Seabourn. Viking Cruises, which originated as a river cruise operator, recently launched its first oceangoing vessel, the 930-passenger Viking Star. And Virgin Cruises, backed by Bain Capital and global investment company Virgin Group, announced plans to build three mid-sized ships for delivery between 2020 and 2022 — around the same time Carnival’s much larger vessels will launch. The company, with headquarters in Plantation, had originally shown interest in larger tonnage, but executives said conversations with consumers and travel agents led them to go smaller. At roughly 110,000 gross tons and with capacity for about 2,860 passengers at double occupancy, McAlpin said the Virgin ships will strike “the right balance” with space to offer activities but a cozier environment that might be lacking on a larger vessel. * Passenger count and gross registered tons to exceed these numbers, but final figures are not yet available.